Originally published in the October 1996 (vol 20 no. 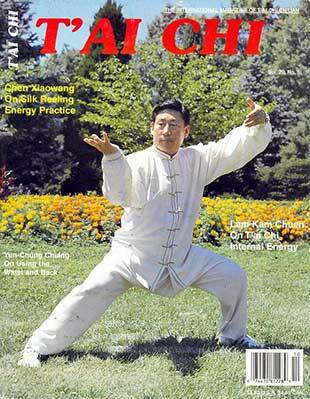 5) issue of T'ai Chi Magazine. The development of silk reeling energy (chan si jing) is the basic method of practicing T'ai Chi Ch'uan and essential to its practice for health and for its efficient use as a martial art, according to Chen Xiaowang, 19th generation successor to the Chen style. As the basic method of practice, Chen said, the function of silk reeling energy is to unify the body and connect the energy throughout the body with the dantian so that it can reinforce movements of all parts of the body. Training in T'ai Chi Ch'uan, regardless of style, he said, has as its function the connection of silk reeling energy throughout the body and making it strong and fluid and accessible. Chen, who was interviewed in New York City during a seminar sponsored by his student Ren Guang Yi, emphasized that cultivation of silk reeling energy "is very simple and at the same time very complicated." It takes its name from the movement of the silk worm itself, he said, and the external movements of the form resemble the external work of the silkworm as it makes silk. On a more complex level, he said, silk reeling energy is the application of the idea of silk reeling to obtain power and energy. He compared the actual, physical activity of silk reeling technique of the human body to the action of a towel that is wrung to squeeze out water. But this action is not just squeezing a towel with the hands but a coordinated movement of the body that involves hands, arms shoulder, waist, hips and knees all together. It is as if the body itself was squeezing itself as if it were a towel. Chen who now lives in Sydney, Australia said the physical process involves the dantian, the mingmen point in the small of the back behind the navel, the waist, back and shoulder right through the arms to the hands and down through the hips to the knees and feet. "The movement of everything goes together," he said. The spiralling of the waist, he said, creates spiralling of the shoulder, elbow and wrist as well as the hips, knees and ankles. "The whole thing is called reeling silk". "There are three basic principles of movement. The first is spiralling. The second is anterior/posterior extension. The third is putting together the spiral with anterior and posterior flexion of the spine" Chen said. While this complex change is taking place, Chen said, the dantian, the energy centre in the abdomen a few inches below the navel, is the centre. As an example he said that in the first movement of the Chen style there is an axis that would go through the dantien horizontally from the navel to the acupuncture point directly opposite in the back. In the second movement the axis would be vertical like the hands of a clock at 6 o’clock. There can be many different axes that intersect in the dantien during a movement but the point of intersection never changes. For the majority of movements, he said, two axes cross both acting at the same time but there can be an infinite number of axes. Many movements involve many axes, he said, but the majority of the moves involve putting together two axes. Silk reeling exercises, Chen said, can involve as little as one axis as long as the whole body is moving together as one unit. "It doesn't matter what axis you are moving around as long as the body is moving as one functional unit connected so that when one part of the body moves, the whole body moves. When you do these exercises, when you do any movement or fajing (explosive force), the whole body is involved." "Most people if they do not train in reeling silk," he said, "can only use 40 or 50 percent of their body to do any one movement. But if you are well trained in reeling silk concepts then movements will involve your total body and you will be able to use 95 or even 99 percent of your body's functional potential. "In order to get 100 percent of your force to come out of your body you must train in reeling silk so the whole body can get involved. If only 50 percent of your body is doing a fajing movement then you will only be able to exert 50 percent of your force. You must use 100 percent of your body to get 100 percent of your functional capacity to do a strike." He emphasized that the functional purpose of why a person would want to move each body segment together - waist, knee, hips, ankles and shoulders - is to use his whole body to accomplish the strike. Chen said that the mechanics of doing the silk reeling exercises involve using the mind as well as the waist, dantian and qi (ch'i). The dantian, he explained, is located three fingers below the navel. The waist he described as the area at the small of the back behind the navel. In the process of doing silk reeling exercises Chen said that waist moves first, followed by the dantian and then the qi. But he added that it is difficult to separate these actions since the mind moves first, causing the subsequent waist, dantian and qi action. He said it is very important for the waist to move, which involves muscle but the dantian doesn't use muscle it relaxes. "The mind is the first to move and then the mind will simultaneously move the waist and the dantian together. Whether one moves first or the other moves first you can't differentiate because they are one and the same." However he added that the mind cannot move the dantian first. "It has to move the waist and allow the waist to move the dantian. The dantian must remain relaxed. There must be no contraction in that area. Once you make it contract and make it tight then energy is blocked there." All parts of the body that move are correlated with the dantian even the fingers, Chen said. While he is rotating the hand, the arm and the shoulder, he said, the waist is turning and all move together. He explained that there is a combination of movements which all coincide at the waist area. Chen commented that many people practice the Chen style in an overly exaggerated fashion making very big movements. He said these kinds of excessively large movements lead to a separation of one part of the body from other parts of the body and is incorrect. A common mistake, he said, especially among those who do the Xin-jia or new frame is to do movements in an exaggerated manner and make a lot of small circles and loops. "That shows that they don’t understand the principles of chan si jing." No one does it correctly the first time he said. "The first thing is to understand the principles and then they can gradually improve. Many people don't understand the principles, like not keeping the shoulder too high. When you understand the principles you can learn to do it better." There are two categories of incorrect practice, Chen said. 1. People know the principles of movement but have not yet been able to execute the movements properly. 2. People think they know the correct principles of movement but really don't know them. They think that exaggerated movement is right, such as large movement of a shoulder. The remedy for the errors of the first category, he said, is time and practice, because they know the principles but are not quite there yet. The better they practice, the better they get. The second category of practitioner can't progress. The more he practices, the more he goes off the correct path of practice. Many people, even in China, do not have a true understanding of the basic principles, Chen said. "Some students who have left their teachers for long periods of time and have become teachers themselves have forgotten that for example when you do a cloud hands movement the fingertips should not pass the eyebrows. Some teachers say that the hand should not pass the head. "After you realise what the principles are and understand the standards, then if you practice incorrectly that's just because you are just beginning and no one can be perfect from the first day. If you understand the basic principles and standards then you will gradually improve by repeating the movements over and over again so that you reach the level of accomplishment set by the principles and standards. "If you try to close the distance between where you are and what the standards of T'ai Chi should be each and every day and each and every time you practice then you will begin approaching the correct form. "But there are many people who do not understand the basic standards of T'ai Chi and who continue to practice a long time but it is very difficult for them to receive the benefits of practice. "First you have to understand that T'ai Chi is a science and it also is an art and that everyone no matter how strong or weak, large or small, can benefit from its practice. You have to look within to see your own body structure, strength and range of motion. Then you can determine the size of your stance, how low you should sit, and what posture is right for you." He emphasized the first and most important thing is to realise that you must not force the movements. "Everything must be natural. Only in this state of being natural would the qi circulate appropriately"
Chen said there are two major ideas concerning the dantian and qi. The first is that even though the dantian and the acupuncture point qi hai (sea of qi) is a centre of qi; not all the qi is collected there. "There is qi in your arms and your legs and your feet and your hands. We call the dantian the centre because that is where all the qi passes through, like a terminal for trains. Everything goes through there but there is qi everywhere in your body. The dantian is where the confluence of qi is." Even though the idea is to bring the qi to the dantian it doesn't mean to try to bring all the qi there, he said. Instead it means the paths for qi have to be open from the centre point called the dantian. "If you will open all the roads connecting to the dantian then the qi at the dantian will be strong. If the dantian qi is strong you will feel very exuberant." He said a person can evaluate themselves. "If you are feeling a lot of energy and feeling exuberant then that means there must be a lot of qi stored in your dantian. If you are feeling fatigued or feeling ill then that means the qi in the dantian is weak. If you are feeling strong and good then the qi in the dantian is very strong as well. If you are feeling sleepy or fatigued or lack energy then that means that the dantian is lacking in the same energy. That is why initially we must find the centre called dantian." Chen said the dantian is very important to the life and health of an individual. "Our first aim in practicing is to preserve this energy. Chen, who taught the technique of the standing pole at his seminar in New York, described the basic method as follows: From the top of the head there must be something pulling it up very lightly or it is as if you can feel something very light on the top of the head. Your head must be very still otherwise that object might fall. The focus of the hearing should be directly behind. When you imagine something light on your head and focus your hearing behind you, he said, "You will feel the qi energy sinking down towards the centre. At this point you should feel that your mind is very clear." Chen said that if the qi is returned from the internal organs to the dantian it allows the organs to function better. He said that a common mistake that is made in the standing pole exercise is making the muscles at the dantian tight. Some people, he said, contract the stomach muscles to maintain balance, creating tension in the dantian area which indicates the dantian is closed. He said if the qi cannot go into the dantian it will go into the chest area which will cause the chest to feel extremely full and uncomfortable. By going into the chest area, he said, the heart has to work harder and a person might feel uncomfortable. He said this condition must be avoided. If a person corrects their posture they will immediately feel that the qi returns to the dantian. In the standing pole posture, Chen said, "Internally, you want to have a sense of stability. If you stand properly you will feel both kidneys will become warm. The dantian will become full and your entire body will be energetic." Secondly, he said, depending on how you move the waist and the dantian that movement will influence the direction that the qi is going to take. When the dantian and waist are moving one way, qi will move out to the hand in an outward spiral similar to wringing a towel. When the direction is reversed, he said, the qi will come back down the arm to the dantian and could go to a different part of the body. He said the movement of qi out and back was part of the mechanics of opening and closing. Chen cautioned that this only concerns the direction of the flow of qi and does not involve the qi going in or out. The flow always continues and does not stop. Silk reeling training, Chen said, has as its first goal the opening of channels and having the qi flow naturally. "Old people, young people, sports people, and weak people get new energy by restoring the natural flow of qi" Chen said. The important thing, he emphasised, is that there be a natural flow of qi through the channels and that it not be pushed. He cautioned that some people do chan si jing too hard following a wrong principle. "Some people try too hard to push it along and that is wrong. The first principle is to be natural." When a person is able to move as one unit as in chan si jing, Chen said, all the body parts are moving together in concert. You are better able to concentrate force at a given point when you fajing. "When you want to punch or strike you can put your energy together so it is focused." He said another aspect of the chan si jing practice is that when a person is punched or pushed by an opponent he is able to change internally and reposition their body so he is never hit in his centre. If a person can change, he said, the qi is not blocked and the person will not lose balance. Balance is lost, he said, because a person’s qi is blocked and the back and dantian tighten up. "Many people when they get pushed and if the force is in excess of what they can withstand, tighten up and their qi is blocked so that they are not able to neutralize. But if you can change, the opponent can never get you to tighten up and then the qi flows and you are able to keep your balance." He added: "When your body' is familiar with the reeling silk concept then you can prevent your qi from being blocked. Practice makes you very familiar with reeling silk. If you practice one year, two years, or three years you will reach different levels. If you practice every day then your silk reeling skill will become more refined and sensitive." With this practice, he said, a person "at first might use a lot of force to counter an attack but the second time might use just enough. It becomes more subtle the more familiar you are with it. When people come at you, then you will not break your energy and not lose balance and other people will very easily lose their balance. Out of this practice of silk reeling energy your skills are easier to use." At a high level, he said, a person can even use the silk reeling skills while sitting. "It depends on your level of training. At a certain level of rooting and skill in using of silk reeling, you are very connected but at high levels your skill is not dependent on rooting. "There are advanced movements where you actually jump off the ground and do fajing in mid-air. So there is no root when you do this. Fajing happens in mid-air. "When a person is sitting or lying down he will use the same silk reeling skills and principles without depending on a root in his feet but if you have the root and you are standing well rooted it is much more efficient that way." The health benefit of silk reeling energy, Chen said, is based on the same principle of the natural flow of qi. "It is a basic principle of Chinese medicine that if the qi is flowing there is no pain. If there is pain it is because the qi is not flowing. "Illness is the state of blocked qi or energy flow. On the skin, if qi is blocked, you will have pain on the skin. If the energy is blocked in the muscles you will have pain in the muscles. If you have blocked energy in the liver or any of the solid or hollow internal organs you will have sickness or illness at that blocked point." All branches of medicine have three basic tools, he said. They give you medication by mouth, injection or surgery. "The final goal is to open up the channels. For example if you have a tumour growing on your liver then to excise the tumour becomes the treatment of choice to open up the qi flow. "If you have an infection that is blocking the qi flow then you want to get antibiotics to get rid of the infection. If you have an internal disease you need to take medicine to open up the flow of qi." Everything grows from small to large even disease, he said. "For example a small tumour on your skin will grow from something very small to something very large. Correspondingly the blockage in qi will be from small to large." "When you cultivate qi in your own practice," he said, "you move and direct the qi so the flow gets larger and larger as you get better at directing the qi. So when a tumour is very small and the qi flow goes there to open up the channels and shrinks the tumour it has a curative effect. You are curing the tumour by opening up the blood flow and the qi flow. Sometimes you need the help of medicine. But sometimes the qi can just open up the flow. That's a treatment property of qi." Another health aspect, he said, is that when there is no health problem "You may be preventing a tumour from happening. You may be preventing problems from happening by opening up the channels and keeping them open. That way it has a preventative as well as a curative benefit." Chen said he knows of many, many cases and personal studies of people who had various illnesses and diseases which were essentially eliminated by exercises he teaches. However he said there has not been a scientific study to specifically demonstrate which movement would cure which type of disease so right now there is a gap in the literature of knowledge of how this works. Chen told of a woman who weighed 220 pounds and had tried all methods of weight reduction to reduce her obesity. She started silk reeling exercises and at first couldn't catch her breath. But after three months of practice she was able to reduce her weight by 77 pounds. He said that now she looks like person of normal weight. Another person had a cardiac problem at the age of 23. Various medical tests definitively showed that he had had numerous heart attacks. Many hospitals would not even accept him as a patient saying that he was terminal. They suggested he should just stay home' and wait for death. But someone suggested that he learn T'ai Chi Ch'uan, so he went to see Chen. At first he had to hold onto a table to do a basic silk reeling exercise. After a month he went to the doctor who re-examined his heart. The doctor found that the disease had stopped progressing and in fact there was some improvement. He kept exercising and after three months the tests showed he was almost normal. The man continued exercising and after a year he was feeling so good that he asked to be sent back to work. The doctor said "No, you better stay home and rest" but after a year and a half he could stay home no longer and went back to work. Now many years later the man is still working and doing well. Chen has found that silk reeling exercises are particularly useful with people with multiple conditions such as heart and stomach trouble who cannot take medication because what would be good for one condition might harm another. Chen said that when he works with someone he initially starts them with silk reeling exercises but if they are debilitated he will have them sit or stand or stand holding onto something. Chen's grandfather was the famous Chen Fake and his father Chen Zhaoxu. His uncle was Chen Zhaokui. All were noted Chen style masters. Chen learned T'ai Chi from his father at eight years of age and as he grew older he practiced the routines five times in the morning and again in the evening for 11 years while helping with the farm work at home. Even when he worked as a purchasing agent he practiced while traveling. The story is told that he abandoned a house he was building for himself because the work interrupted his training. He was appointed a coach at the Wushu Academy of Henan Province in 1980. The same year he represented the province in the national Wushu tournament and won the T'ai Chi Ch'uan title. He subsequently won many titles nationally and internationally.